Special Containment Procedures: Until such time as SCP-804 is found to be without any memetic effect it is to remain in its original location at the former site of █████ █████, Alaska, where exposure to the elements prevents its reactivation. A 30m x 30m camouflage tarp is to be maintained over SCP-804 and facilities for armed guards and testing are to be maintained 130 meters from its location. Trespassers are to be treated with a Class-A amnestics and returned to the nearest town of [DATA EXPUNGED] or terminated at the discretion of on-site security. In the event of SCP-804 being approached or seized by a hostile armed force, Contingency 804-X is to be executed. Description: SCP-804 is the remains of an art installation titled "World Without Man," revealed on ██/██/20██, by the defunct artists' group Unelmat Paremmasta Maailmasta. According to documentation retrieved and deleted from the artists' website during clean-up procedure, SCP-804 was originally a large, clear globe of the Earth, with several smaller globes and video equipment within. Promotional material on the website implied that the globe was to display images of pastoral wilderness untouched by mankind contrasted with visuals of abandoned human industry and decaying landmarks. Upon activation before a small audience of prominent environmental activists and artists from the nearby community of █████ █████, SCP-804 began to display its destructive properties. We can only speculate if the device's output was intentional or not, as those involved in its construction perished during the incident or have gone into hiding. While the globes within SCP-804 rotate, all man-made artifacts within approximately 100 meters begin to rapidly deteriorate until completely disintegrated. The effect applies to anything ranging from machinery to buildings, clothing, plastics, synthetic chemical compounds and any tool more complex than a sharpened stick of wood. The area of effect grows the longer the device is active, with the effect growing ever stronger at its source. Human tissue is also affected at a slower rate of decay, causing victims to become emaciated as they lose body mass—leading up to collapse of the skeleton and death, with the body swiftly breaking down into component matter shortly thereafter. Non-human life is completely unaffected. Persons who escape the area of effect experience symptoms similar to prolonged starvation but can return to full health with proper care. If not for the fact that it is not entirely immune to its own effect, SCP-804 would have had the potential to remove all trace of humanity from the globe in a matter of weeks. Judging from the observed rate of destruction upon original activation versus its current capabilities under testing, SCP-804's capabilities have been impaired by the damage it caused to itself. However, sustained use still presents an extreme threat especially if the device is somehow refined or repaired. Due to the circumstances in which SCP-804 was secured it is strongly believed that the device also possesses some form of mental compulsion on those who view it, but testing is still on-going to determine if that property has also been compromised by the decay of SCP-804 and how it might be contained. See Recovery Log for further information. Recovery Log SCP-804: Approximately 5 minutes after activation, the effect of SCP-804 reached the nearby community of █████ █████. Citizens who were not at the art show initially responded with panic and made several emergency calls. Due to the extreme remote location of the town, the first response was made by a small single-prop aircraft which arrived about thirty minutes later. Although the plane entered the area of effect and was quickly lost, the pilot did relay a radio message describing the swift and complete destruction of the town's buildings. At this point, the Foundation became aware of the situation and teams of agents were sent to investigate. By the time agents were able to arrive on scene, SCP-804 had been intermittently active for nearly eight hours and as a result the town and everything in a radius of [DATA EXPUNGED] was wiped clean of any trace of human civilization. Upon arrival, one plane was immediately affected; fortunately, the crew was able to make an emergency landing before the physical structure of the plane collapsed around them. Unfortunately, their equipment and clothing was also quickly disintegrated, exposing them to the extreme cold of northern Alaska. As a result, six agents had to be treated for hypothermia, but all are expected to return to duty with no lasting effects. After recovering the crew of the downed plane, agents set up a perimeter and were able to observe the epicenter of SCP-804's effect. The surviving population of █████ █████ had crowded around the remains of the device. All subjects observed were severely emaciated and suffering from severe hypothermia. Exposure had only worsened the effect of SCP-804 and many subjects were observed with missing digits and even limbs. The survivors were approaching the device in teams of two to three to push at the single remaining globe within SCP-804's housing in order to maintain its effect. As each subject eventually succumbed and collapsed, another from the crowd of onlookers would shuffle forward to take their place. Survivors were seen to be cheering and encouraging those who were maintaining the device until their turn to push the frosted globe came up, although such manual operation was not sufficient to maintain even the radius of effect the device had achieved before damaging itself. Agents were authorized by O5-█ to open fire on the crowd. Although bullets experience the same decay as any other artifact, their velocity was enough to strike lethal wounds before decomposition. When the remaining globe of SCP-804 ceased to spin, the effect ended and agents were able to move in and secure the device. Survivors attempted to resist but lacked the strength to impede Foundation agents and began to act in a disoriented manner once they were removed from SCP-804. With no adequate facilities remaining to provide shelter for them all, many survivors chose to simply lie down in the snow and die while others attempted to provoke agents into using lethal force upon them. Those who were taken into custody refused to answer any questions and were able to refuse enough care that they did not recover from their physical decay. 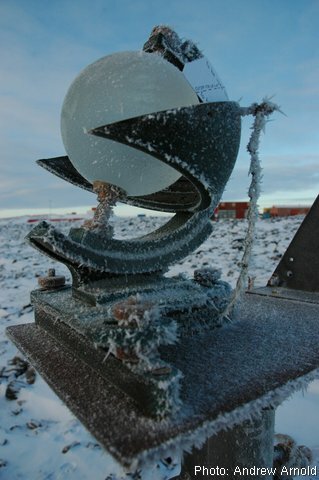 As exposure to the extreme elements of northern Alaska appears to adequately contain SCP-804 by freezing its remaining machinery in place, it was decided to leave the device on site and under guard along with a [DATA EXPUNGED] in the unlikely event that a hostile faction attempts to secure the device. Addendum SCP-804 is not to be contained within any Foundation facility until it is certain that we will be able to prevent anyone from being compelled to activate or maintain the rotation of the globe. Even a few minutes of SCP-804's effect could destroy its own containment and seriously compromise any other containment nearby. This is the third annual review of any "supernatural" memetic component to SCP-804, and we still have not produced any significant results. It's time to put the controversy on SCP-804 memetic properties to rest once and for all. Yes, SCP-804 possesses memetic properties, and yes, these properties were responsible for driving the survivors of its activation event into sacrificing themselves to maintain the device. But there is nothing especially virulent or dangerous about SCP-804's memetic properties. Only a few select personality types, outlined in the attached report, have any desire to re-activate the device. Most notable are the D-class sociopaths who show similar amusement when presented with a big red button that says "kill everything." We've been looking at this all wrong, there is no magical compulsion that could drive so many people to destroy themselves. There does not need to be. Everything we observed during recovery can be explained by mundane group dynamics and human nature. The device had just wiped away all trace of the work and the lives of a reclusive artist and activist community. The buildings crumbled into dust so fast that people were not even injured in the collapse. And at the center of it all A World Without Man turned around and around on its increasingly rickety platform, offering a deadly premise that had been presented to them as an ideal. A cure for the virus known as humanity. So why did a group of activists throw themselves and their neighbors into the deadly workings of a machine that they thought was going to wipe all human life off of Mother Earth? They simply wanted to do it.